low calorie rots. 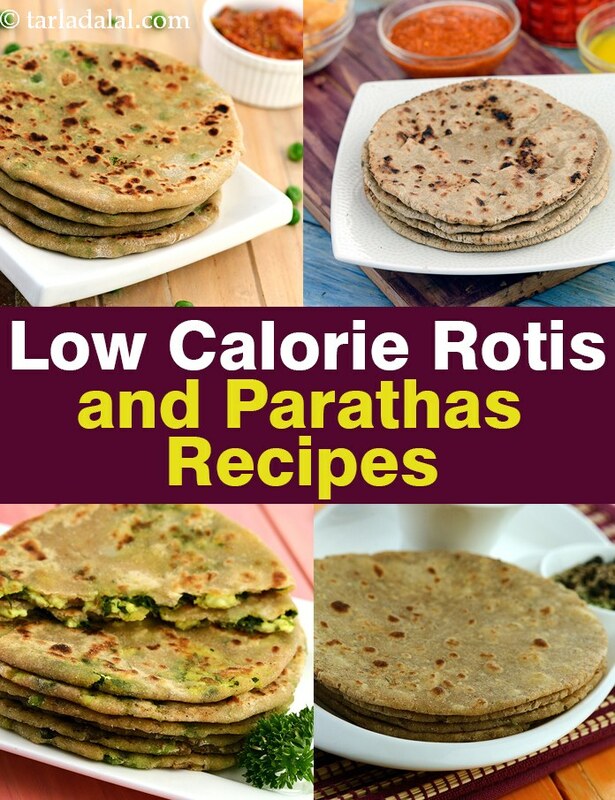 low calorie paratha collection. When we think of rotis and parathas, we all are aware of the fact that the first cereal to be avoided is plain flour or what we commonly term as ‘maida’ and replace it with fiber rich whole wheat flour. This section precisely makes use of wheat flour. However replacing wheat flour with other cereals like ragi, bajra, jowar, soya etc is equally important to get some share of other nutrients like iron, calcium and protein too. And on days when you want a complete low carbohydrate, protein rich boost, try out recipe of Almond Bhakri. 1. To cook them very little fat and if possible with olive oil. 2. Avoid addition of fat laden ghee and butter while kneading the dough for the roti / paratha. 3. Always add one vegetable to the roti dough to make up for your vitamins and minerals. 4. Serve and enjoy them immediately as they are cooked in less fat, they might turn chewy with time. Make your rotis more healthful by adding a combination of grain flours to it, just like this recipe for Multigrain Roti that has a variety of flours of grains like jowar, bajra, ragi and Bengal gram are combined with Indian spices to give it a nice traditional flavour. Try your hands on making this Nachni and Onion Roti flavoured with onions, coriander and green chillies, tastes delicious when served steaming hot right from the tava. Combine this Nachni and Onion Roti with a choice of your subzi or accompaniment and enjoy! Did you know? You could make rotis using oats? Here we have a low calorie recipe which has added oats in it and it’s called Methi Oats Roti. Perked up with methi it is a really good option for weight watchers and diabetics. Add high quality proteins to your parathas by adding good quality protein ingredients like milk, curd, buttermilk, paneer and egg. Methi Paneer Paratha is a quite popular and flavourful low calorie paratha because low fat paneer is used for its preparation perked up with methi leaves. Another tasty paratha is Besan Paratha which is healthy as it is loaded with fibre, iron and B-complex vitamins. Combine this yummy paratha with a healthy raita or dal to enhance its taste. Green Pea Parathas are healthy low cal enriched with nourishing green pea puree which also adds fibre and protein to it. It is also cooked with very little amount of oil and low fat curds which make it low in calories.